Floral, Fruity, Powdery. 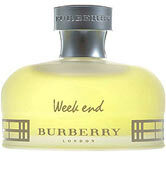 Created in 1997, Weekend for women is a sharp, floral fragrance. This feminine scent contains a blend of peach, apricot, marigold and is accented with musk, vanilla and sandalwood making Weekend is perfect for daily use.